Artist Sam Van Aken was curious about the effects of weather on body and mind. So he is transforming the atmosphere inside the Munson-Williams-Proctor Arts Institute’s (MWPAI) Museum of Art in Utica—at least for a little while. 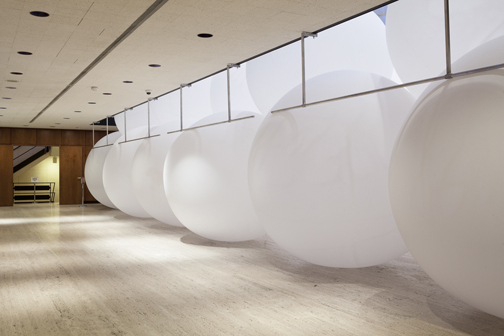 The associate professor’s exhibition, “A Hole in the Sky,” explores altering matter and mood through his work that includes the installation of giant weather balloons filled with crisp Maine sea air inside the museum’s Edward W. Root Sculpture Court. The exhibition, which was commissioned by the art museum specifically for the space, began in November and runs through Feb. 23. The 60, 10-foot balloons are an impressive site. 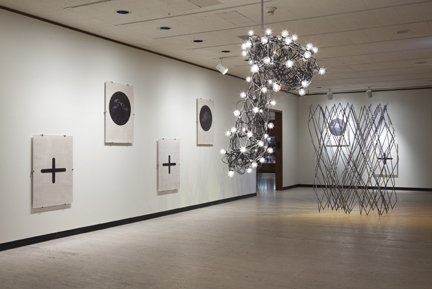 The MWPAI project is composed of two parts: “Acadia,” the sculpture of 10-foot weather balloons, and “Peanut Butter and Dead Fish,” an accompanying exhibition of visual pieces that change the atmosphere of the individual, their psychological state, by creating auras or a change in psychological state. The title piece is a suspended framework that holds 60, 25-watt lights, which flicker at random. When standing in front of the installation, with eyes closed, the flashing light causes optical hallucinations. In December, a Twin-Prop plane flew through an altocumulus cloud to cause the super-cooled water droplets to fall as rain. The occurrence created a Hole in the Sky, which produces the distinctive rays of twilight breaking through the gray fall sky. Van Aken’s fascination with the state of weather grew as part of another project, “Tree of 40 Fruit.” For this work he grows grafted fruit trees, each tree having the capacity to grow more than 40 different types of stone fruits, including peaches, plums, apricots, nectarines, cherries and almonds. With an opportunity to exhibit the work at the Armory Show in New York City, Van Aken needed the trees to blossom in March. By bringing them inside and providing enough heat and light, he forced the blossoms. He then began thinking about the impact of the atmosphere change on the trees and the challenge of the harsh Syracuse winters. “I kind of imagined myself as the tree and then taking it even further,” Van Aken says. The idea of changing the weather has been central to every culture, from tribal rituals to weather modification such as cloud seeding. And a large concern is also about climate change. “I was using the weather as a metaphor for something almost like a song, where weather becomes this metaphor for mood and emotion, but weather is also a condition, it is the state of things,” Van Aken says. For the Utica exhibition, Van Aken rented an industrial air condenser and traveled to Acadia National Park in Maine, where he taught at the University of Maine. “I wanted to get the smell of the air, and by condensing it, I was able to draw all the moisture and impurities out of it to capture the ocean, pine smell,” he says. At the museum, he used a compressor to infuse the air into the balloons, which are a type of meteorological balloon that is used, for example, in Buffalo where they are released to test the upper air atmosphere. “The balloons are deflating, and by the time the exhibition closes, the exhibition will essentially disappear,” says Van Aken. 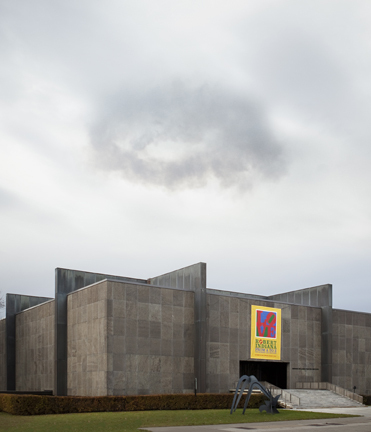 Van Aken’s project was perfectly suited to the art museum’s two-story skylit interior court, says Mary Murray, the museum’s curator of modern and contemporary art. “There was something magical and also playful as the installation was taking place, with enormous balloons bouncing into their places and then glowing at different times of the day through the late-autumn and winter light,” Murray says. Visitors are struck by the transformation of the space—and even smaller guests are captivated. “Little kids love this installation,” she says. The changeable nature of the exhibition has made it especially dynamic. “The weather balloons are deflating as the weeks progress, so there is something poignant about it too,” Murray says. The exhibition has been all that Van Aken imagined—very much comparable to the renderings he did to represent the project to Murray and the art museum’s director. “It looked pretty outrageous, and then actually to pull off the installation, they were surprised—but in a good way,” he says.